This item is used in our Stainless Steel 300 and 600 watt transformers. It is the main control unit that includes the photocell and the digital display. Instructions included for ease of installation. Please contact us if you have any questions regarding this item. This thing is a beast. Way overkill for what I needed but I would like the option for future expansion. Very heavy and nice stainless steel case with digital display. It is wall or fence mountable with two key holes in the back. Previously had a 300w Unit from Home Depot which was their top line piece, after years of use it finally quit. Installed this and WOW all my lights are much brighter now. I am running both strands each of them on a seperate 13v circuit. Would be nice if the photo cell was on a seperate line so you could mount it individually from the box. Dual 300W Transponder. It works perfect. The setup is simple. Note: The instructions are poor. On each side, split your dual low voltage wire. One side goes in the COM and the other goes in either 12v, 13v, 14v or 15v. If you have a long run, place the other side of your split wire in the 13v , 14v, etc. For short runs the 12v is fine. The unit is very heavy. So, you’ll need to hit a stud when mounting it (there’s probably a joke in there somewhere). I needed to call Best Pro Lighting with a question and they were great. I would recommend. Upon removing this item from the box it was shipped in, the mounting bracket had a large dent along the rear mounting bracket. Additionally, the packing foam surrounding this area was significantly compressed compared to the rest of the foam packing material. The attached photos show the conditions I have described. I plugged in the transformer and the “LED BLOCK” would only display a “1”. I was unable to change the display by pressing either arrow on the switch labeled “ON/OFF TIME SETTING”. The lower arrow made a tactile and audible ‘click’ when pressed while the upper arrow had no indication that a button even existed in that spot. 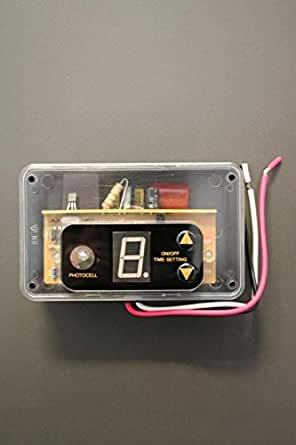 Using a voltmeter, I measure the DC voltage across the “COM” to each of the possible connections (12V, 13V, 14V, & 15V); each reading was zero (turns out it is actually AC output). A few seconds after covering the “PHOTOCELL” to block light, the transformer began to hum and the ‘Power OFF’ light illuminated. I was still unable to change the ‘LED BLOCK’ display. I submitted this information to the seller via Amazon’s online input and then called the seller (who answered right away in english!). I received an email the same day saying a replacement was on the way. It arrived via FedEx within a few days and worked as advertised. I am now a happy customer and very much appreciate Best Pro Lighting promptly rectifying the situation. ?? Had an electrician install this when he was doing some other work for me and then had him come back when it didn’t seem to work properly. Maybe we are doing something wrong. It is programmed to “A” setting which means it should come at dusk and it does one night, and then maybe the next, but then it won’t for a few days, and then it comes on again… I don’t care that much as I can set it to “0” which is manual and just put them on when I need them but I would think my problem would frustrate a lot of people. Perhaps someone else has had this problem and has a suggestion…? Purchased it to replace and existing transformer for our pond lighting. Works excellent and have had no problems for the last two years. This transformer is everything I was looking for and more. My past transformer lasted less than year, had a 60 cycle hum and cost about the same price. This transformer is much better built, NO hum, has multiple voltage outputs. Night time eye works great. This is built like a brick house. Highly recommend purchasing. Built like a tank! Beautiful craftsmanship. Powering all devices just fine.